Follow Amanda’s guide to what to wear for Salsa and you’ll feel right at home on the dance floor. 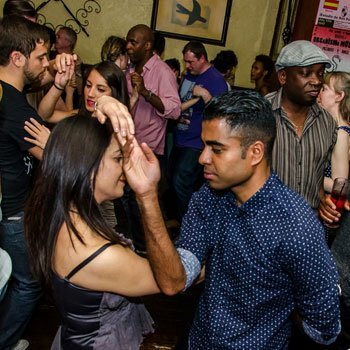 The main priority when deciding what to wear for Salsa is how comfortable you feel and whether you can still move without restrictions. You don’t need to dress up for Salsa classes and, although we’ll be giving you a good workout, sportswear isn’t essential either. Many men will feel just at home in a t-shirt and jeans as will they trousers and a shirt. Although remember you’re likely to sweat a little! The key for women is to wear clothes that allow you to move your arms and legs freely without having to keep pulling things down, hitching them up or putting your straps back where they should be. As the session progresses, you’re going to warm up, so wearing layers you can remove is also a great idea. When it comes to footwear, just don’t mention stilettos. When you’re starting out, it’s not necessary to invest in specialist dance shoes, though who are we to deny you an excuse to extend your shoe wardrobe? Simply choose a pair of suitable shoes with smooth or leather soles which will stay firmly on your feet. Flying footwear never looks good on the dance floor, so mules, flip flops and sling backs are definite no no’s, as are any shoes with a heel of more than 2.5″. Here’s a tip: If you can’t walk briskly in your shoes, you will not be able to dance in them so find a pair you could in theory run for the bus in. Do not wear trainers with lots of rubbery grip or tread as these are guaranteed to make your legs, ache and heavy rubber soled shoes will break your movement unnecessarily. Even if you could dance in them, they’re not suitable and they will ruin our lovely dance floor as well making it dangerous for other dancers in your proximity.